Who can doubt that it would be a great honor to have Jesus come to our home for dinner, and to prepare a meal for him. And yet in the beautiful story of Martha and Mary Jesus teaches us that it is a far more exalted honor simply to sit at his feet and to repose with Him in prayerful adoration. This is a lesson of significant importance to our lives. “Martha, Martha! You worry and fuss about a lot of things. But there’s only one thing you need. Mary has chosen what is better, and it is not to be taken away from her” (Luke 10:41-42). What busy lives we lead. Prayer seems passive and unproductive – almost unnecessary. We become prey to a “practical naturalism” which values activity over the interior life. Moreover, we whittle away precious hours that could have been spent in prayer, meditation and adoration hypnotized by “petty, peripheral things” like video games, shopping channels, endless hours of sports and a whole dazzling array of web-sites that convince young girls that the only meaningful activity in life is to become a super-model! “I have publishes several spiritual works…but I do not think I have written a more useful work … in which I speak of prayer as a necessary and certain means of obtaining salvation. If it were in my power I would distribute a copy to every Catholic in the world in order to show him the absolute necessity of prayer for salvation” (edited from A Short Treatise on Prayer, p. 5). My dear friend, to neglect prayer is like cutting off your oxygen supply for spiritual life (to paraphrase a quote from Saint Teresa of Avila). Prayer is the most important activity of your life. Learn to spend quality time with…God. Sit at His feet; concentrate your soul on God; listen attentively; converse with your God as your very best friend. There is only one thing you need, closeness to God in prayer, so don’t let it be taken away from you. References: This note is influenced by Father Grou’s essay, “Martha and Mary,” in his famous Manual for Interior Souls. It is Father Grou who says “concentrate your soul on God” and “listen attentively.” The book by Saint Alphonsus, A Short Treatise on Prayer, is highly valuable and should be read. The phrase, “petty, peripheral things,” was used by Dietrich Von Hildebrand. Any ads in this post are from WordPress and not this blog. Hi Tom, This scripture has always been one of my favorites, but I always felt that Jesus was being a bit harsh, and maybe dismissive of Martha. 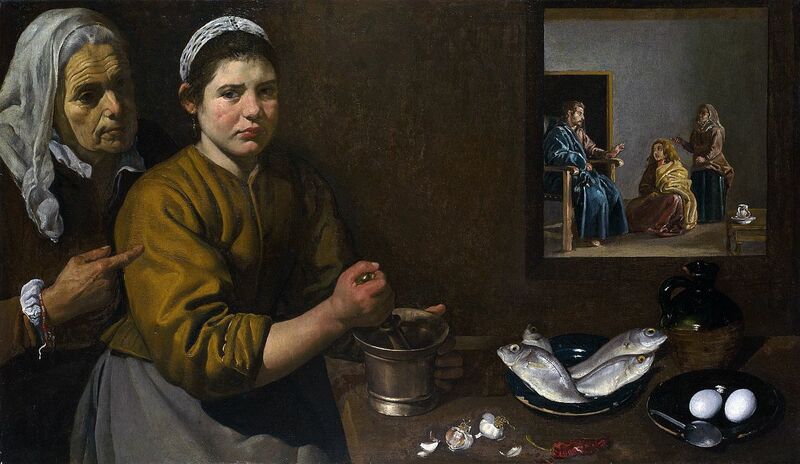 After all, if both Martha and Mary had elected to sit with Jesus, who was going to prepare the meal and clean-up?